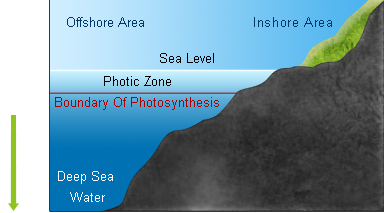 Deep sea water is the sea water below the thermocline (about 200 meters below sea level), where the sun does not pass through. It's of low temperature (6 to 9 ° C according to national marine investigation), rich in minerals and nutrition, clean, and with few pathogens. Its applications include the manufacturing of drinking water, aquaculture, food processing, salt and health supplement production, medicine production, water treatment, and makeup tonic production. Its target industries are varied. Traditional technique, augmented with new technology and based on deep sea water, creates emerging water resources with high added values. As the sun does not pass through the depth of the ocean, there is no organic production and no issues with water mass structural stability. It's safe from the malignant elements, pathogens, and persistent organic pollutants (POPs) on land. 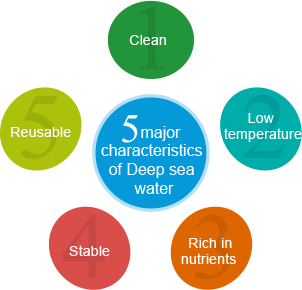 Deep sea water maintains its low temperature and stable water mass structure all year long, and is seldom affected by external environmental change. It's rich in nutrients such as nitrate (NO3-), phosphate (PO43-) and silicate (SiO32-) and other trace elements. In addition, its mineral composition is similar to that of the human body's, making it very absorptive. Being in a high pressure and low temperature environment all year long, deep sea water is mature and stable. Unlike underground natural resources that are not reusable, such as petroleum, coal, and natural gas. Deep sea water's cold energy is regenerated in winter. Nutrients and minerals also regenerate from within a few years to within a few millennia.